It's the mecca of sporting events in the United States. It's the Champions League final equivalent of American Football. It takes place, every year, on the first Sunday of February, and is almost always the most-viewed event in the United States. It's in fact the equivalent of a cricket World Cup final, or an India-Pakistan cricket match or - if this isn't hyperbole enough - the Olympics opening ceremony. Over 110 million viewers watched last year's event. It's the Super Bowl, the final game of the American football calendar, and this year's event - the Super Bowl 50 - happened last night at the Levi's Stadium in the San Francisco bay area. American football, for those wondering, is like rugby and played by two teams. The actual time of play on the field is barely 20 minutes - with the game not necessarily the most anticipated part of the evening, which lasts 3-4 hours. The absolute most significant part of the Super Bowl? The ads. Yes, commercials, those things you close when they pop up on your laptop or use for loo breaks when watching TV. 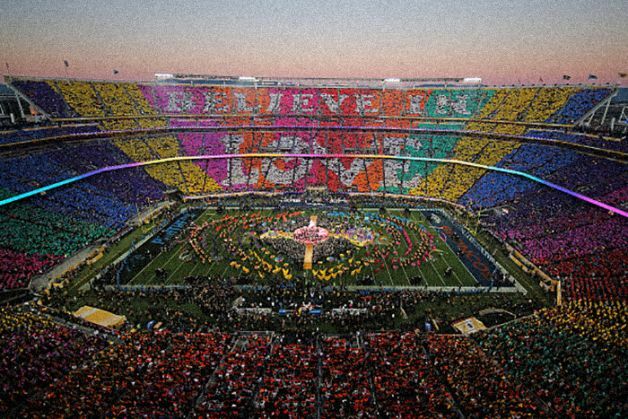 Because despite halftime performances by Beyonce, Bruno Mars and a surprise guest appearance from Coldplay, it's the incredible, inventive advertising that is the true heart and soul of the Super Bowl. With more than 1/3rd the United States population glued to their TV sets year after year, its no wonder Super Bowl commercials are where the money is spent. This year, a 30-second slot went for around $5 million. Compare that to an ad during the fifth season of The Walking Dead - one of the most watched shows on TV - that fetches a paltry $400,000. The average cost for a 30-second primetime spot on a broadcast network in 2014 was $112,000. So why are these ads such a big deal? It's a classic chicken-and-egg deal: the Super Bowl ads are discussed before the game, during the game and after the game, then discussed over and over in households nationwide, and can stay in viewers minds for many weeks thereafter. Naturally, advertisers treat them with the deference filmmakers give to their Oscar-hopefuls. A successful ad during the game can be a gamechanger. Here's our pick of the good, the weird and the ugly from Super Bowl 50's commercials. Another year, another Super Bowl and another win for Doritos. The makers of everyone's favorite chips has consistently been making great ads. For Super Bowl 50, Doritos came out with two ads. One featuring a woman giving birth with the baby stretching for chips. The other features dogs, getting together, to buy some good old Doritos. 2. Amazon Echo: "Baldwin Bowl Party"
Amazon's first Super Bowl ad and just look how great it is. Alec Baldwin is the perfect party host. Joined by NFL quarterback legend Dan Marino, both of them trash-talking, aided by something better than Apple's Siri, Amazon Echo. Baldwin asks how many championships Moreno has won and in return Moreno asks how many Oscars Baldwin has won. Some good old banter. there Oh, in case you missed it, Missy Elliot drops her new single! T-Mobile, the company people love to hate, roped in Steve Harvey and the ever-popular Drake for both their videos. Steve Harvey pokes fun at the his very own bad Miss Universive call. It's T-Mobile mocking Verizon's ad with a bunch of balls touting their network. Drake does a perfectly timed delivery of "These changes don't ruin the song at all!" The ad tries to tell you about cellphone contract language to the tune of Drake's Hotline Bling. Beyonce. She performed at the half-time show and also announced her brand new world tour. Enough said. Before Marilyn Monroe became who she was, she was William Dafoe before his first Snickers bar. Strange choice for both Monroe (why Snickers and not Twix) and Dafoe (that outfit was just strange looking). They should've had Bruce Jenner in the Snickers Commercial. This is the definition of weird. It features as Vox puts it, "three bros are set upon by a horrifying creature of unimaginable menace." May you never be able to sleep properly at night after watching this advertisement. Sure, someone not being able to poop is a common occurrence but then a man gazing at a women longingly as she has toilet paper stuck to her shoe? Makes no sense. Weird, weird. Definitely weird. Enough people on prescription opium that we need ads for opium constipation pills. Great country! I watch the Super Bowl mostly to learn about opioid induced constipation. 1. Butterfinger: "Bolder Than Bold"
Skydiving off an airplane while riding a bull? This should come with the wrestling disclaimer of "Do not try this at home" across the screen for the entire 30-minutes. Except, it doesn't. We are all at risk, I'm afraid to say. 2. Dollar Shave Club: "Zeke"
Crafted by the CEO himself, this ad could have been made for a dollar. That's all I'm going to say here. Just with an Advil, you can do all of that? Isn't of relieving pain, this ad just gave me a headache that will not go away. Super Bowl babies! Sure a lot of people liked it, but this is just creepy. It's a strange theory. But hey, if you like it, don't forget to sing along! Drink beer and kiss your wife. This is how the Super Bowl babies commercial happened. What the Super Bowl Babies ads don't tell you is people are screwing because they're bored of the game. Helen Mirren trying to dissuade people from driving while drunk? Sign me up. This stern but witty reprimand is a much watch for all.